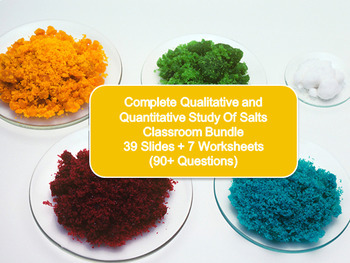 A complete bundle with 39 Slides with 7 Worksheets and up to 90+ questions and answers, providing a compact and complete understanding of formation and identification of salts. Content includes the solubility test of nitrates, chlorides, sulphates, carbonates, hydroxides, qualitative analysis of salts includes understanding mole ratio, moles (mass and volume of salts and products formed), calculating concentration and molarity of aqueous reactants. Methodology of creating salts includes acid + base reactions, acid + metal reactions, acid + carbonates reactions, double decomposition process (precipitation).